A short history of the revolution in Portugal in which an army rebellion overthrew the fascist dictatorship. The real revolution was in the urban workers took control of their workplaces and farm workers took control of their farms and organised production themselves while the parties of the left merely jockeyed for positions of power, eventually killing the revolution. 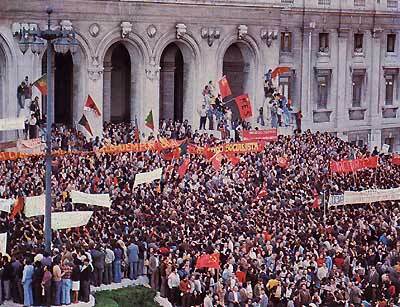 On April 25th, 1974, a radical faction within the Portuguese Armed Forces, the MFA, revolted against the government. Until that day Portugal had been under a fascist dictatorship for over half a century. Whether the MFA was left or right wing inclined was unclear at the time. The military revolt created a space where people could effect change in their lives and the opportunity was grasped eagerly. Left-wing activists began returning from exile, and new political parties sprouted up. The parties all used the situation to gain political power in the government. Ordinary people, in contrast, used the situation to improve social conditions in their communities and workplaces through new autonomous organisations. It was here that the true revolution was fought and is of most interest to us. Portugal was the most underdeveloped country in Europe. At the time 400,000 people were unemployed. 150,000 people lived in shanty towns, one million had emigrated and infant mortality was nearly 8.5%. After the revolution workers immediately began struggling against the harsh economic conditions. Strikes had been met by brutal force under the fascist regime but lack of experience proved no deterrent to the Portuguese working class. During the summer of 1974 over 400 companies registered disputes. One of the most significant of the strikes was within TAP, the semi-state airline. It showed whose side the supposedly radical government was on. TAP workers had a history of militancy. In 1973 three workers had been murdered by the paramilitary police force during a strike. On May 2, 1974 an assembly of TAP workers demanded the purging of all fascists in the company and the election of union representatives to the administration council, which was in effect a council for the bosses. When it was discovered that some of the representatives had raised their salaries the union came under a lot of criticism. In August an assembly of maintenance workers reduced their 44-hour week to 40 hours by refusing to work the extra four hours. Another assembly, held without union officials, drew up a list of demands including the purging of staff who showed "anti-working class attitudes", wage increases and the right to reconsider collective contracts whenever the workers pleased. The demands were not accepted by the government, so in response the workers declared a strike, elected a strike committee and posted pickets. All international flights were halted. The new Minister for Labour, a Communist Party member, called on the workers to resume work while CP rank and filers opposed the strike within TAP. The TAP workers stood fast and eventually the government sent the military to occupy the airport and arrest the strike committee. Two hundred workers were sacked but were reinstated after mass demonstrations and threats of further strikes. The 40-hour week was gradually introduced. The first provisional government introduced anti-strike laws around this time. This government was a coalition that included the Socialist Party and the Communist Party. The TAP strike was the first large-scale strike after April 25th and the government's response was an indicator of how any of the 'post-fascist' governments would treat workers' struggles. The working class however was unperturbed by this. In October another 400 companies registered disturbances. The trade unions were relics of the fascist era and were considred treactionary by many. Workers found the need for more democratic and independent ways of organising. It had become common for assemblies of workers to elect delegates to the committees. These committees were normally elected annually and were subject to recall. Though most of them were not revolutionary they were an expression of people's distrust of the 'left parties', the government and the military. By the end of October 1974 there was about 2,000 of these committees. In the summer of 1975 the movement began to develop further. Frequently, when demands were ignored by management, workers would occupy their places of employment and in many cases set up systems of self-management. Anywhere from a dozen to several hundred workers would take to running the businesses themselves. In Unhais de Serra 1,100 textile workers rid themselves of the management and elected a workers' committee to run the factory. It is estimated that about 380 factories self-managed and 500 co-ops were in operation by the summer of 1975. Like the workers' councils, the co-ops were not revolutionary. They still had to contend with the constraints of capitalism. They had to make a profit and members received different wages. Despite many co-ops being able to reduce the prices for goods or services, this inevitably led to competition between different co-ops. Amidst the growing culture of self-management the Proletarian Revolutionary Party started a campaign to launch workers' councils. Delegates from major industries, and soldiers' and sailors' committees, met with a large contingent of PRP members. The idea was to have councils based on workplace, boroughs and barracks; and from these local, regional and then a national council would be elected. It sounded good, sadly the PRP were more concerned with creating bodies they could dominate rather than councils capable of representing the working class. "Working class parties" were invited to join. This showed their very limited idea of what workers are capable of. Giving places to political parties as well as to directly elected workers' delegates not only diluted democracy but also implied the 'need' for some sort of elite to lead the masses. If the self-proclaimed 'revolutionary parties' could not win enough support to get their members chosen as delegates by their workmates, they were to get seats as of right just because they called themselves "workers parties". A strange notion of democracy! After April 25th people began occupying empty property, unwilling to wait for governmental action. The government, afraid of people's anger, decreed a rent freeze and allocated money and tax exemptions to builders. The increase in homes built was inadequate and more and more people occupied empty buildings. 260 families from a shantytown in Lisbon moved into an empty apartment block near the city. The military ordered them out but were forced to back down when the families refused. In response to the housing crisis people began to organise collectively. In older working-class and lower-middle-class areas Autonomous Revolutionary Neighbourhood Committees were set up. The committees were elected from general assemblies of local residents. They arranged occupations of property for use as free crèches, workers' centres and for other community services. In Lisbon one local Neighbourhood Committee organised for some 400 empty houses to be taken over. A "social rent" was paid that went towards improvements. Another organisation set up was the Federation of Shanty Town Committees. It was independent of political parties and came to represent 150,000 shanty town dwellers. It called for new housing estates to be built in place of the shantytowns, for expropriation of land and for rent controls. The housing organisations faced some of the same problems experienced by the workers' organisations. Neighbourhood and shanty town committee meetings were seen as opportunities for party building by left parties. Party members, often times well practised at public speaking and debating, got elected to key positions on the committees and then used them as a platform for their own particular political propaganda. A lot of ordinary residents stopped attending meetings when they felt they were dominated by a particular group. All in all, the "workers parties" seemed to be more a hindrance than a help to these committees. By trying to run things in ways compatible with their ideologies they stifled the spontaneous organisational methods of ordinary folk. At the same time one third of Portugal's population worked as agricultural labourers. They worked for half of the year and were unemployed for the rest of it. When the rural workers saw their opportunity for change they seized it wholeheartedly and began taking over farms, ranches and unused land. At the beginning the government rarely intervened. There was much positive co-operation between agricultural and industrial workers, and the various workers' organisations. In Cabanas an abandoned farm was occupied with the help of a local neighbourhood committee. Machines were taken from a nearby factory to help clear the land. In Santarem a meeting of 354 farm workers declared that a massive amount of land was to be occupied. Other workers, armed with pickaxes, arrived in trucks to aid the agricultural labourers and at the end of it over ten major farms were collectivised. Socialism seemed natural to the labourers and there was never talk of dividing up the land. The land was worked collectively and owned by the village as a whole. By August 1975 official statistics reported that over 330 different land collectives were in operation. All these struggles happened against a backdrop of six provisional governments, a few coup attempts and rumours of NATO and right-wing conspiracies. Where the armed forces had created a space for radical social development by workers it quickly re-invaded the space with programs for government and the economy that had little to do with the revolution. Any independent initiatives were generally stifled by the left and centre "workers parties". The capitalist system itself was never truly tackled en masse and co-ops, collectives and workers' committees had to negotiate on capitalist terms for the price of their labour. Even the workers' committees were little more than workers' self-management of their own exploitation. One Trotskyist paper blamed the lack of revolutionary progress on the fact that there was not a "workers party". In fact there were at least fifteen!